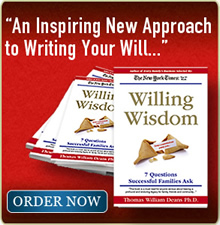 Business owners looking for advisors who have demonstrated a commitment to business exit planning, can begin with the following firms who have hired Tom Deans Ph.D. to deliver his Every Family’s Business and Willing Wisdom keynote speeches to their valued clients. An international best-selling author and full-time professional speaker Tom has shared his message with hundreds of thousands of people in 14 countries. 2009 Speaker of the Year.